This pier cabinet is a charming living room accent piece, as well as a crucial part to the entertainment wall unit. Three adjustable shelves in the open storage area, and one adjustable shelf in the bottom cabinet provide ample space for books, room decor, or electronics. Crafted from poplar hardwood solids and cherry veneers with a multi-step warm oak finish and a clear coat top finish, this piece boasts high quality, long-lasting beauty. 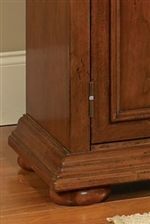 The Homestead Warm Oak 3-Shelf 1-Door Pier Cabinet by Home Styles at AHFA in the area. Product availability may vary. Contact us for the most current availability on this product.